Why does Mugabe wear two wristwatches? Does President Robert Mugabe wear two watches to keep up with the time in Zimbabwean time as well as the time in Singapore, a favoured destination of his? Or is it because the ageing Zimbabwe leader is now “buying time”, as one Twitter user suggested? 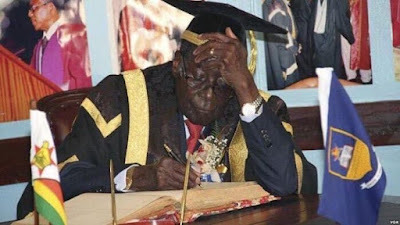 Zimbabweans have been scratching their heads over a photo that reappeared this weekend on social media showing the president in full academic dress wearing not one but two timepieces. One of the watches looks to be silver, one gold. Though some thought the picture was taken during a graduation ceremony at the University of Zimbabwe on Thursday, it actually dates back to October 2015. Tweeted @ConcernedZimCitizen: “Can someone explain why our old president is wearing two watches here?”. The responses came thick and fast. They were mostly from those who are less fond of the Zimbabwe president, who is now 92 and has been trying to clamp down on rising social discontent in the last few months. “To keep track of his life expectancy. I suppose,” said @edo_ug. User @CdeBKMpofu suggested Mugabe was trying to keep track of the “time difference between Singapore and Zimbabwe”. Some Zimbabweans joke that Mugabe is just a “visiting president” because he spends so much time – and presumably money – on foreign travel, including to Singapore, where he travels for medical attention. Thursday’s ceremony was disrupted by a brave protest from a student leader demanding jobs from Mugabe, who is chancellor of the University of Zimbabwe. Higher Education Minister Jonathan Moyo has said that it is possible that Tonderai Dombo could lose his degree over the protest.